Beautifully cased in the best goat skin leather available, hand made end papers, gold leaf to all page edges, gold tooling to the inside endpaper edges, raised bands on the spine, with gold blocking to the spine and front boards, comes with slip case as per picture. Limited to 30 copies only! price £175 - Sorry sold out. I have one customer willing to sell. Also please get in touch if you wish to purchase a copy, I may be able to help. 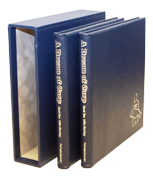 This twin set, both beautifully cased in the best goat skin leather available, with hand made end papers, silver leaf page edges all round, silver tooling to the inside endpaper edges, raised bands on the spine, with silver blocking to the front boards and spine, both come enclosed in a suedel lined slip case as per picture. The ding on the slipcase has now been rectified, I closed it in my cabinet not realising the length of the books! Doh. Slip case did its job though, books are fine. Only 10 sets of these done. Sold instantly and have changed hands for over £700. Sorry dont know of any for sale at the moment. Beautifully cased in the best goat skin leather available, with hand made end papers, gold leaf page edges all round, gold tooling to inside endpaper edges, raised bands on the spine, with gold and brown blocking to the front boards, gold blocking to the spine, comes with slip case as per picture. One of our quickest selling leathers, many to friends and family of the author. Copy Number 35 available at £250 Please contact me for details. Beautifully produced in the best Goat skin leather available, with hand made end papers, gold edge to three sides of the paper edges,(traditionally to save dust/dirt colouring) gold tooling to the inside endpaper edges, raised bands on the spine,Thicker Tapered boards, Blind Blockwork to front, with gold blocking to the spine and front boards, comes with suedel lined slip case as per picture. Original price £205 - Sorry sold out. Copies have changed hands for £650! Number 6 available for £450. Comes complete with signed set (Dave Steuart) of postcards and bookmarks originally supplied with the book. Please contact me if interested. Beautifully produced in the best Goat skin leather available, hand made end papers, gold edge to top side of the paper edges,(traditionally to save dust/dirt colouring) gold tooling to the inside endpaper edges, raised bands on the spine, with gold blocking to the spine and front boards, comes with slip case as per picture. price £165.00 - Sorry sold out. Copies have changed hands for £600! Beautifully cased in the best goat skin leather available, hand made end papers, gold leaf page edges all around, gold tooling to the inside endpaper edges, raised bands on the spine, with gold blocking to the spine and front boards, comes with slip case as per picture. price £160.00 - Sorry sold out. Original hardbacks available please see our new books page. Few remaining!